Yesterday, I learnt about having a word for the year from some blog posts I read and decided to give it a try. As I prayed about it this morning, I felt a confirmation in my spirit that I should get on board the word train. You see, I am not a blind follower of anyone or anything, no matter how well promoted they are. I need to be certain that what I’m doing is what I should be doing now and not simply what everyone else is doing. And before I could pray much, the word “love” was given to me. I am to love my husband, my “children”, my siblings, my in-laws, my extended family, my friends, my students, my brethren, my work colleagues, in fact, anyone that I have dealings with, more. I hesitated. My feeling was, “I’ve never done this before and I get to start with the big one.” I’d thought the word would be “completion” or “accomplishment” ’cause I have so much unfinished business that I am yet to address, my Ph.D on the top of that list. But the Lord said He wants to teach me to love as He loves the church. That’s fantastic! But truth be told, it’s also scary. Even if as a believer, I’m not totally selfish, yet I see myself holding back from doing all that I can for people at certain times, that is, doing so much and no more. I rationalise what I do, hoping I’m not misunderstood, taken advantage of or despised. A few times, I’m more concerned about taking care of number one. Clearly, that is not how Christ loved the church as explained in Ephesians 5:25-27. What makes this so challenging is that we’re not talking about my immediate family and close friends alone. One does not need much convincing to love one’s spouse, children, parents and best friends sacrificially. But anyone you have dealings with? That does not sound wise or practicable. Yet, I think if the love were so selective, it would fall far short of the love of Christ as seen in Romans 5:8. There’s no way I’m going to be able to do this kind of thing without surplus grace. Then I remember some scriptures I shared on Twitter lately. Love is patient and kind; love does not envy or boast; it is not arrogant – 1 Corinthians 13:4 (ESV). Could God have been speaking to me to prepare my heart for this journey? Probably. (I know that whatever I post is as much for me as for anybody else.) And that gives me some thrills approximating lightheadedness (the positive kind). I also recall the commanment the Lord Jesus gave in John 13:34. That should be the handiest as I have a little song about it I learnt many years ago that extends to the next verse. I promise to do my best in this regard by God’s grace. So help me God! I enclosed “children” in inverted commas ’cause I have no biological children but have young people that I have a mother-child relationship with. “To launch into the deep at the Saviour’s command” refers to Peter’s experience as recorded in Luke 5:1-7. U-Gee, pronounced as the letters UG, is the way some friends shorten my native name, Ugochi. Have you ever done the word for the year stuff? If yes, care to share your word for last year and how it worked for you or your word for the present year? Love is a beautiful thing designed by God himself but the problem is that it's often misinterpreted especially among youths. They go about committing all sorts of crimes all in the name of LOVE. The love we preach is the LOVE of Christ which is Unconditional. Let's learn to show genuine love... ... It pays. Nice piece ma !!! Thanks a whole lot, Joy! May God multiply grace upon us to like our Lord Jesus. Bless you, Paschal! I trust you are well. Loving ones neighbour as oneself is something i have made up my mind to keep doing because this article has given me more reasons to. Unconditional love knows no bound just as Christ's love was for us and he died for our sins. I believe am nobody not to love my neighbour.. Ma, to be open-faced from the onset this article caught my attention till the end. Nice one! May God bless you. And bless you abundantly too, Chika! Thank you. I pray so too in Jesus' name. Thank you, Jennifer, and have a wonderful year. Amen in Jesus' name. That was very thoughtful of you. You are highly blessed in Jesus' name. Love, a great word but we have refuse to see it in the Godly aspect of it rather we see it in the worldly aspect of it. I just pray that we will imbibe that spirit of Godly love in us to as to be very close to God, cause when we do, great things will be our portion. Amen. Great word to start up the new year with. Thank you, Flawlex, and I believe it's gonna be a great year. I feel those goosebumps too, Angela! Overcoming self will be the test but God is bigger than any challenge or obstacle and I'm just going to trust Him all the way. Thank you so much for dropping by. Abundant grace on your ministry too in Jesus' name. Thank you so,much for the encouragement, Godsgift. I truly appreciate it. Have a splendid new year in Jesus' name. Amen. Thank you, Kingsley, and I pray you have the best of the year in Jesus' name. Quite interesting. "Word for the year". If I'd had one for the week and survived then a month probably. God will help me. 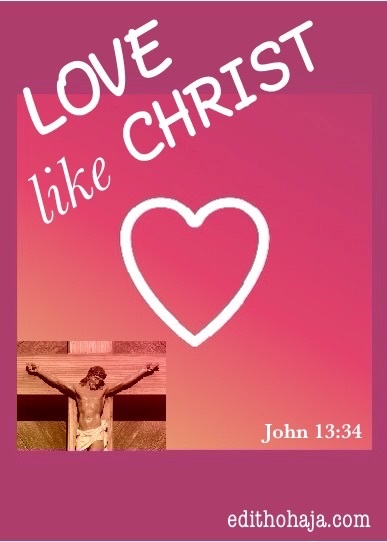 Talking about loving like Christ. Isn't such a bad thing, I mean its just to love isn't it. Lets go back a bit. Jesus was humiliated, spat on, kicked, stoned, pushed, flogged with flesh tearing whips then crucified and even given vinegar to drink. Then his words: "Father, forgive them; for they know not what they do." Luke 23:34 KJV Who loves like that?! Well, its all by his grace, when we remember the things he went through to redeem us, we should also love because of him. I mean, that's where we get our identity as Christians, right? Nice one, Kingston! Only by His grace! love is great and awesome because i have been experiencing love from GOD, my parents, my siblings and other people. this year is also a year for me to show such love back to them but not only them but all the people am going to come across or deal with in any dimension.Thank u ma for such a pace setter for this glamorous new year. Thank you too, Matthew! You are blessed in Jesus' name. Deacon Adigun Temitope Idealism I have come to understand that love is like a seed, planted by a "pure heart" for future harvest and before harvest, it must produce fruits. For instance, a pastor that in charge of a parish that do fight with his wife at home and we are expecting peace to reign in such church...To cut it short, love must start from oneself - do you even love yourself? The love of man is usually conditional. It is a two way thing. you give me I give. But that of Jesus Christ is a perfect paradigm of unconditional love. He exemplified this by accepting to come and die in the most horrible way for us all. It is incumbent on us to love one another unconditionally even as we have begun another journey this year. The piece is well written as always. Excellent post Edith. Loved it! :-) You said, "What makes this so challenging is that we’re not talking about my immediate family and close friends alone. One does not need much convincing to love one’s spouse, children, parents and best friends sacrificially. But anyone you have dealings with? That does not sound wise or practicable. Yet, I think if the love were so selective, it would fall far short of the love of Christ as seen in Romans 5:8." Selective love, wow! That is what many of us unintentionally and perhaps unconsciously display. May our love know no boundaries and reach everyone, especially those we deem less deserving. After all, we form part of them. Great blogging sister. Keep up the kingdom work! Amen to that prayer. Glory to God, Brother Joe, and abundant grace on your ministry too in Jesus' name. I hav decided to draw nearer to God this year,now from this post I have discovered one vital thing & that is to start with 'Love' yes I have to love like Christ. Aunty, I am richly blessed by this post. Praise God! It's not something we can do by our own power but with God's grace. love this post. what we really need now is love. there is too much hate and judgement going around. social media makes it worse as what we cannot say to a person's face we make use of anonymous profiles to do it. the saying treat others as u want to be treated has become a mere saying than pratice. we need to really love our neighbours and pray for our enemies because if we dwell on hate we are probably gonna remain stagnant. You're right. Love is better than hate by light years. Bless you, Charlemagne! "Love" is such a beautiful word. I truly believe that at the ending of the year you will have learnt so much about loving like Christ. My prayers are with you Edith. Thank you very much, Ami! I'm getting the nudges already and hoping I keep up with Him before they turn to shoves. Lol! Our God is good! Thank you, Shalom! I say "Amen" to your prayer in Jesus' name. Loving people with all you've got makes life easier in my opinion. Less drama, less grudges and less feelings of disappointment. There are some disadvantages but, the advantages outweigh. Eat.Pray.Love. Yes, the advantages far outweigh.... God bless you, Ifeanyi! Speaking from this point of view '' the Lord said He wants to teach me to love as He loves the church'', the fact remains that the love Christians of this new testament have towards their fellow Christians is decreasing every day and i believe that is the reason for this mandate given to you ma. For instance, in a Church where the low income earners are relegated to the back seats and those in 'high class' are given the front seats because they can give more offerings and tithes. should we say there is love in that same Church? this article serves as an eye-opener on how Christians of this era claims to live in love meanwhile they live in lies. I pray that God will help us to correct our errors and be our brother's keeper. You've always been big on Love ma, with a smile always on your face and a laughter always ready to be shared with all. In life, when you know that it is not easy to love is when you are hurt by people around you.But that is when you need to stand firm and love more no matter what. I pray God gives me the heart of Love and Forgiveness in all situations. Nice prayer. Amen. Bless you, Chioma! Right thing to do! Bless you, Victor! Love is the greatest of all virtues, so the bible said. This year, I must show love to those around me. And above all, I will reconcile with those I offended in the past years, and that includes my creator! Very touching, Collins! You've got all the right words. May God help you to match them with action in Jesus' name. And I pray for unlimited favour in every area of your life this year in Jesus' name. Indeed to love like Christ is a task for us humans that can only be done by his grace.because it takes his grace to love unconditionally. You're right, my dear! It is only by His grace that we can emulate Him successfully. Ma, you are more than loaded o. so overwhelmed on how you able to know what battles in people,s mind especially, young people.1st Cor.13:4 have truly defined love but believe ma, at times it so difficult to equalize this LOVE. You find out that most times peoples attitudes leaves you with no option than to grade one higher than the other. I personally force myself at times to demonstrate this love on some people just for my Christianity sake. "LOVE" is actually a critical aspect of human life.The write-up is a nice one, especially now that February 14th is around the corner. Well done ma, I enjoyed this. More grace as you drop more interesting write-ups! Glory to God, my dear Chet, and thanks a lot for your kind and constant prayers. You are blessed! True, but only by His grace can we do this. May God grant it to you in Jesus' name. A heart filled with love for God and man can never do wrong. That's really nice, Covenant! Sounds like a quotable quote. Bless you! Correct, it is the love that God has shown to us by sending His Son as a ransom sacrifice that should move us to love him in return. Thanks for these inspiring words. Thanks a lot too, Samuel! You are highly blessed in Jesus' name. Amen and Amen in Jesus' name. Love is the greatest of all virtues...we all need to love like our heavenly father who demonstrated his love on the cross for our sins...bless you ma. Love is good and love is everything. The lord instructed us in his word that we should love our neighbour as we love ourselves. love knows no pride and sin.If we should begin this year with godly love towards our neighbour, then there will be no news of killings, religious intolerance, political nuzzle and so on. Indeed love is the ultimate. The world wouldn't be in so much chaos if men learnt to love. Love is necessary if the world must be a better place. Nice one ma! God showed his love to us by sending his only begotten son to died on the cross for our sin. We should learn to love everybody around us they way we love ourselves. Love is the answer, love is the only way, love one another thats what jesus said..love ! Love!! Love!!! Love is the greatest virtue. We should learn to love everyone around us including our enemies. Always pray to God to give you a loving heart. Love!!! It's easy to profess love and yet very difficult to do even loving my enemies. Help me to love Father, irrespective of who. I am truly motivated by this piece. I never really thought about having a word for the year. And yes, you are correct MA, to love each and everyone is not as easy as it sounds. Hopefully, your work would inspire many, like myself, to work towards spreading love to others. Lord, make me encounter and exhibit love, not this worldly love but the character of God in my life never ceasing in every season.